This is a light and simple dish that looks elegant and is easy to prepare. Lemon can be adjusted to suit any taste. First, put a large pot of salted water on to boil for your pasta. Time to shred the squash and zucchini. Please leave the skin on the vegetables to incorporate that nutrition. Because you are shredding them, the texture difference will be negligible and the specks of color look like confetti. Pour the pasta into the salted water and cook according to the package. Meanwhile, in a large non-stick pan, saute shredded zucchini and summer squash in margarine until lightly browned and soft. Basically, cook while stirring until the liquid they release has disappeared. Drain the pasta and add to the pan with the vegetables. 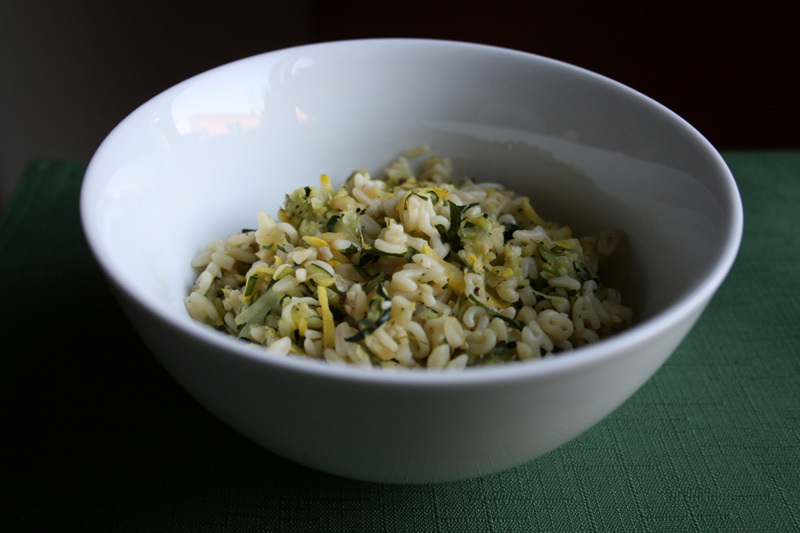 Remove from the heat and add the tarragon, dill, lemon zest and lemon juice. Stir to combine well and season to taste with salt and white pepper. There are many ways to change up this recipe.. add in finely diced red bell peppers for a holiday side dish. Any other veggie your kids love can hop in for that performance. You could even add tofu, seitan or vegan sausage sliced up to create a full meal. So, I love a challenge. I think veganizing recipes becomes more fun for me the more ingredients that need reworking and replacing. 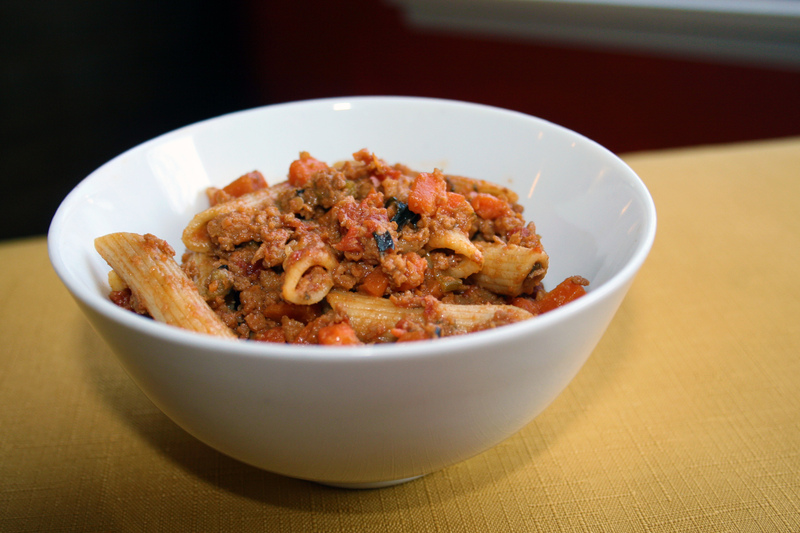 Today, I did a Vegan Bolognese – I mean, other than the mirepoix, conventional recipes basically contain butter, milk and ground meat. This version I created is not only vegan, it is significantly lower in fat and calories while maintaining that really rich, intense flavor and supple texture. First we are going to sweat the vegetables. Put the onions, carrots, celery, margarine and oil in a heavy-bottomed Dutch oven and place over medium-high heat. Cook for about 10 – 15 minutes, stirring occasionally, until the vegetables are lightly browned. Now add whichever veggie meat crumble you prefer and season with salt. Pour in the soy milk and nutmeg and cook, stirring occasionally to prevent sticking, until the milk has mostly evaporated. Add the wine and cook, stirring occasionally, until it has almost completely evaporated, This may take up to 30 minutes. Dump in the entire can of tomatoes, juice and all, and the tomato paste. Stir the pot to combine everything well. Once the tomatoes have started bubbling, reduce the heat to the lowest setting so that the sauce is barely simmering. Cook uncovered for up to 3 hours, stirring occasionally. If all of the liquid evaporates before the cooking time is up, add water 1/2 cup at a time as needed. When the time is up, make sure all the liquid has evaporated before you remove the sauce from the heat. Cook a box of your favorite whole grain pasta according to directions and toss with the sauce. So, someone I know brought over some chicken they had previously grilled for me to make dinner with. Everyone knows I love to use leftovers creatively. Immediately I thought of chicken salad. I do get tired of the same old recipes so I looked to my pantry for inspiration. Lo, and behold, an avocado and some black beans. Mexican style it was! This is so easy and turned out great! It has a bit of kick from the cumin and black pepper and zing from lemon juice. Makes a lovely, chilled salad for a hot night with some melon or grapes as a side dish. 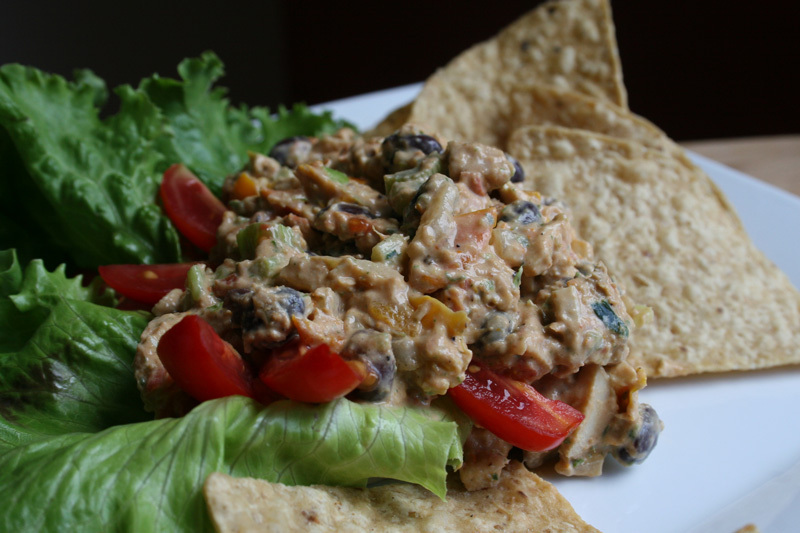 We loved it in lettuce wraps, on tortilla chips and for sandwiches. The kids were not fond of it but all the adults made me swear I’d put the recipe on my blog to share with you anyway. Try it with your family and take them on a trip south of the border. Let me know how it turns out! First you need to chop up your main ingredients. Dice the chicken, onion, celery and roasted red peppers. Drain and rinse your black beans and mix all of these ingredients together in a large bowl. In a blender or food processor, combine all the dressing ingredients. It will be easiest to cut the sun-dried tomatoes with kitchen shears. I always get the dry sun-dried tomatoes in the deli section. If all you can find are jarred, they will work just fine. Roughly chop your herbs and garlic scapes. “What is a garlic scape?”, you may wonder… I certainly did when we began receiving them from our CSA. A garlic scape is the the flowering stalk of hardneck varieties of garlic – the taste is like garlic, but more mellow. I love this entry from “Not Without Salt” extolling the virtues of garlic scapes (and has some awesome recipes). Go search them out at your local farmers market; once you try them, I think you will love them too. If you cannot get them easily or it is out of season, try adding two or three garlic cloves instead. Juice 1/2 of a lemon and add this to your blender or food processor with everything else. Finally, add all of your spices. Pulse and stir in turns until everything comes together and the sun-dried tomatoes are blended nearly smooth. Spoon the finished dressing over your chicken mixture (it will be thick) and mix well. You can serve immediately or keep chilled in the refrigerator as long as you like. 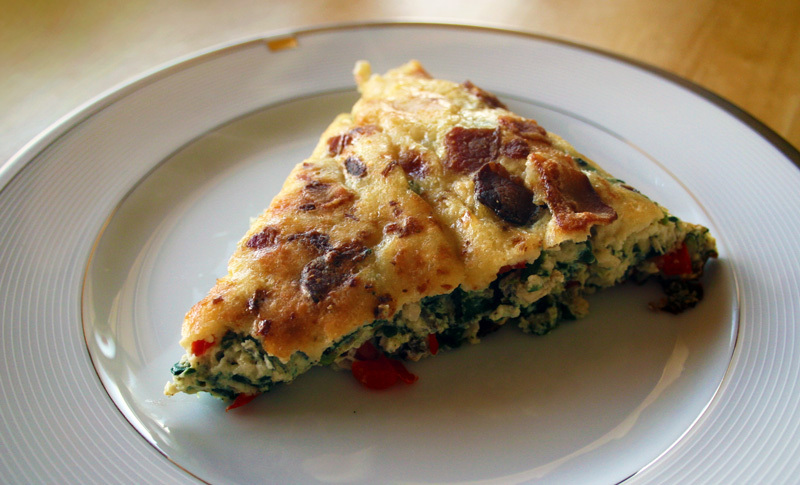 A frittata is your friend in the sneaky kitchen. Much like quiche, it functions as a Trojan Horse for all kinds of veggies. I had a lot of fresh produce and needed to find a way to get it into my children without complaints. Everybody in my family loves eggs, so this was a no brainer. Only problem was I had never made a frittata. So I did what I always do; I looked up a bunch of similar recipes to get the jist of what goes into one and adjusted in my head for pan size, pantry availability, taste and nutrition. I wanted to serve a crowd (the twinkies will eat 5-6 scrambled eggs just the 2 of them); I already had cooked down greens and chicken and a bunch of farm-fresh vegetables; I made a spice combination that never fails in my family; and I knew the cheese would need to be reduced as well as the whole eggs and cream because breakfast items benefit from bacon. First and foremost, prep all your vegetables; cook and crumble your bacon (we have precooked in our freezer that we broil up in the toaster oven for speeds sake); measure out and set aside your cheese; and whisk together your eggs and spices in a separate bowl. Despite the long ingredients list, this dish is straight forward and really comes together fast in the pan. It is best to be prepared. Spray your deep, oven-safe, 12 inch skillet or everyday pan with cooking oil and place it over medium heat. You can start out by sauteing your garlic, zucchini, red pepper and green onions until soft, about 5-6 minutes. Then, add your mushrooms and cook until tender. Finally, stir in your precooked greens and chicken and heat through. Give your egg/spice mixture a quick whisk to catch any spices that fell to the bottom and pour it over everything in the pan. Stir immediately to ensure the egg surrounds your filling ingredients completely. Now you can sprinkle the grated parmesan cheese and bacon crumbles evenly across the top of the surface. Turn your heat to medium-low and cook, covered, until the eggs begin to solidify and the bubbles break on the surface. Remove the lid and go ahead and transfer your pan to the oven. Broil until browned lightly – about 3-5 minutes. Don’t walk away… that cheese can go from golden yumminess to burnt in an instant. Once golden browned and sizzling, remove your pan from the oven and let sit 5 minutes. Let me tell you, the smell alone will bring them running to the kitchen. Slice your frittata and serve with confidence and maybe a touch of bravado – for you have made a fancy looking dish that will impress with style and flavor and nourish both the soul and the body. My husband and I enjoyed it immensely. 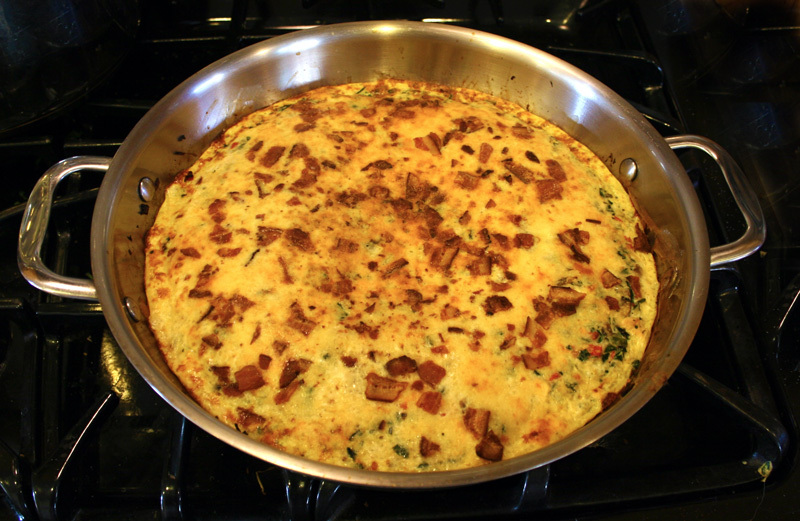 We will be making more fritattas for sure! I am apparently raising a little chef. My oldest has been coming up with recipes lately. We finally had the opportunity to try one out. You know what? It was fabulous!! This is a great way to get a homemade soup on the table in just about 45 minutes (depending on how fast you chop). This soup has that cooked-all-day, slaved-over-my-stove flavor because of the use of store-bought stock and rotisserie chicken. Let someone else do all the work and feel free to take the credit. I know I do! Through our CSA we have been overloaded with greens and so decided to throw a bunch of kale in here to use it up and add nutrition. Turned out lovely. All the kids and grown-ups in my immediate family loved it. My mom even liked it – and she doesn’t like soup. Give it a try, you wont regret it. In a large stock pot add all 8 cups of stock. Begin heating on medium and add your chopped carrots, celery, green onions, and seasonings. Bring to a low boil, cover and cook about 20 minutes or until carrots start to soften, stirring occasionally. While the vegetables are cooking, shred or chop the white meat from a pre-cooked chicken and chop your kale. I chopped it pretty fine so that it would be unobtrusive and, lets face it, impossible for children to pick out. Once the carrots are fork tender, you can add the kale to the pot. Allow to wilt and add the chicken. At this point, you can let the soup simmer until you are nearly ready to eat. The noodles that my daughter picked were amazing. Brightly colored and infused with vegetables. I guess it goes to show that raising kids with healthy options and watching food network is inspiring. That’s my girl! 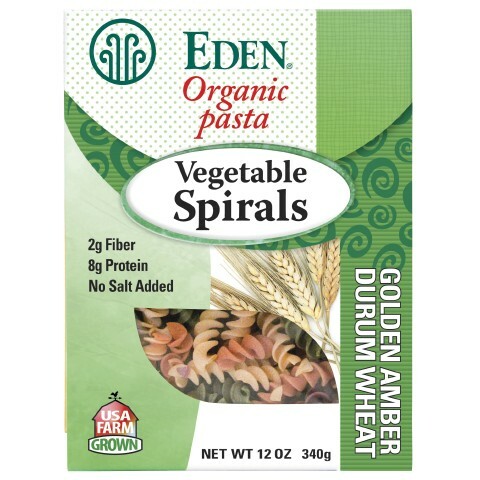 These are by a brand called Eden – Organic Pasta Vegetable Spirals. We found them at Whole Foods, but any noodles will work, of course. 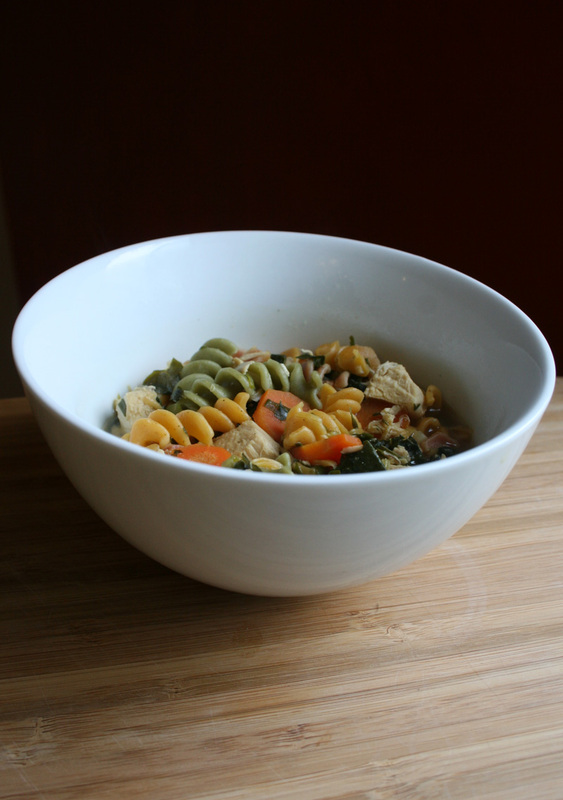 When your monkeys get restless and dinnertime approaches, add the noodles to your soup. Stir and boil for 8-10 minutes until the texture is right for your family. I think in the near future I will try to make a whole-grain dumpling as an alternative to noodles… I love chicken and dumplings! When I figure it out I will be sure to share. My twinkies love oatmeal, particularly the flavored instant oatmeal sold in individual packages. There is a lot of unnecessary junk in those, however. 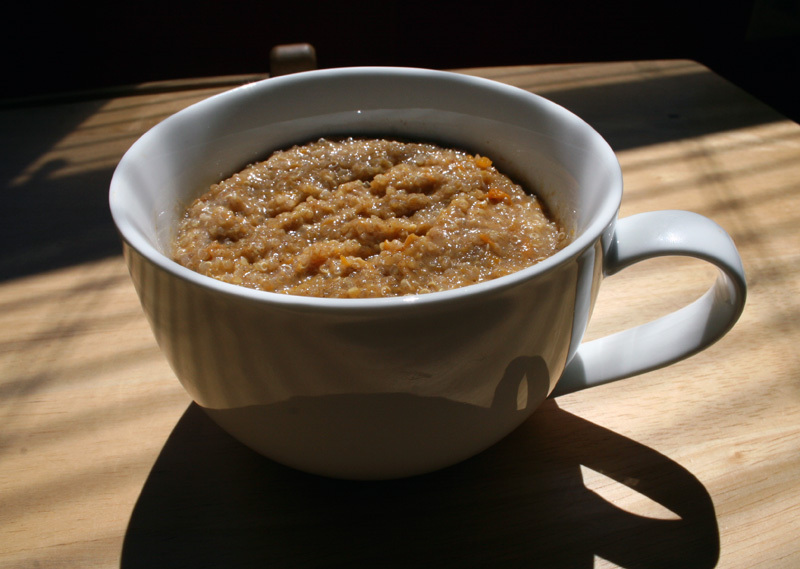 Oatmeal made from scratch is nice, but I was striving for something with more rounded nutrition. Some kind of whole grain. I did some research and found out that just 1 cup of quinoa has 8 grams of protein and 5 grams of fiber, 0 grams of sugar and only 3 grams of fat. I’d never cooked quinoa totally from scratch before and wasn’t sure if I could make it work for breakfast. After all the quality they most like about oatmeal is how creamy it is. Quinioa has never been described as creamy. Pleasantly chewy, they say. I have heard of quinioa taboule, quinoa pilaf, and quinoa salad – they compare quinoa to couscous… but I have never heard of creamy quinoa. You know I love a challenge! This turned out fantastic. I used Bob’s Red Mill Quinoa (it is pre-washed and pre-soaked) and prepared according to the package directions. Delicious! And oddly enough, slightly creamy. hmm. Then I added in some healthful and tasty fruits and veg that I had lying around. I can conceive that just about anything your kids like will mix well into this recipe to change it up. Letting them choose will increase the chances of them trying it and loving it. First, heat 2 cups cold water to a boil, add 1 cup quinoa, bring back to a boil and cover. Reduce the heat to medium and cook for 12 minutes, or until all the water is absorbed. While the quinoa is cooking, mince your dates (or any other dried fruit) and mash the banana and sweet potato. When the 12 minutes is up, fluff the quinoa with a fork and stir in your dates. Cover and let set for 15 minutes. This was my husbands brilliant idea and it worked so well to rehydrate the dried fruit. Dump the quinoa/date mixture into a bowl and add 1/2 cup vanilla yogurt (or any flavor you want). Stir well. Add your banana and sweet potato and mix to combine. That’s it! So simple and so good the babies wanted 3 bowlfuls! Please make this. You’ll love giving a sweet treat to your kids and rest easy in the knowledge that it will power them (or you) through til lunch. Bonus: it reheats like a dream. Just add a splash of milk or soymilk to loosen it back up if it gets thick. The eldest gave it a 3.5 of 5. Not sold, on the texture, but she has texture issues. My husband is not a fan of asparagus. The only asparagus I ate growing up came from a can. I found some beautiful asparagus tips at the store the other day and just felt inspired to try and make something tasty. I love a challenge! I called this side dish Asparagus for Mom and Dad for several reasons. It is so simple and tasty, you won’t want to share; using only half a pound makes 2 perfect servings; and it is a touch spicy from the garlic and pepper flakes. Very enjoyable! I enjoy how there can be a real depth of flavor from so few components. Tangy, garlicky, salty, spicy. My husband even ate it! Spray a nonstick skillet with cooking spray. Cook your minced garlic, teriyaki and red pepper flakes over medium heat until the garlic starts sizzling, about 1 minute. 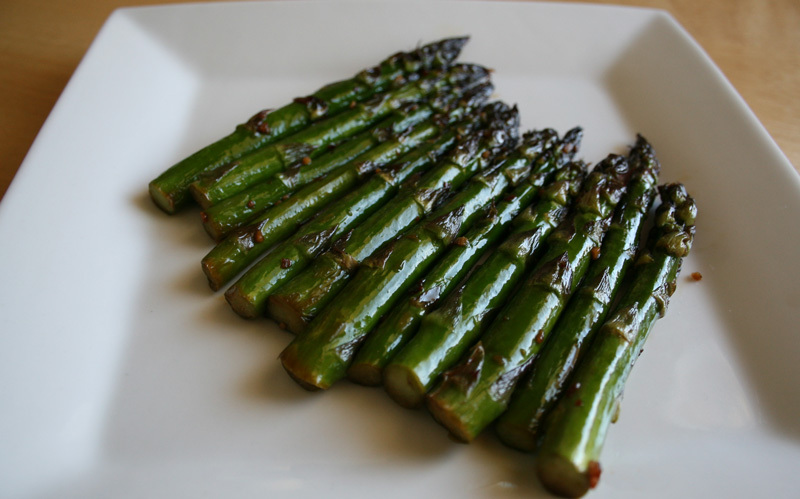 Add your asparagus and toss with tongs to coat. Cook, stirring or tossing occasionally until the liquid has disappeared. Now you can de-glaze your pan with the wine and cover to allow the asparagus to steam for about 5 minutes. Remove the cover and allow the sauce to reduce until nearly gone. Plate and eat. My mouth is watering remembering! Maybe I need to head to the store again. Who are the 3 Munching Monkeys? Hi! My name is Allaina, and the aforementioned monkeys are my darling daughters. The eldest is currently 9 years old and the twinkies just turned 4. They all love to help in the kitchen and our family's love of food and cooking has inspired the eldest to strive toward owning a bed and breakfast when she grows up. I call my girls my monkeys because they all shriek, climb things and generally spend much of their time tumbling around. Often I feel like I run a zoo, not a household! I am a 35 year old Mother to 3, deliriously happy wife of 10+ years, graphic designer, singer, artist and quadriplegic. I find such joy in preparing delicious food and sharing that love with friends and family. I also can not resist the challenge of using difficult ingredients in new and resourceful ways and I strive to create irresistible flavors with much of what I have on hand - who has time to always run to the store? Nutrition is very important to me. When we started receiving our organic CSA share a few summers ago, I was overwhelmed by the number and variety of vegetables we were receiving. I didn't know what to do with half of them. I despaired at my children's suspicious glances into the bags. I began in earnest to try to create recipes that would entice the kids to the table but allow me to feel good about what they put in their mouths. In this process, I discovered quite happily that I have a knack for being sneaky in the kitchen. This blog is my attempt to share my recipes and observations, empower other parents in the kitchen and have more happy family dinners throughout the nation.